A report out of Hawaii says that scientists in Turkey have made glowing bunny rabbits. No, really. 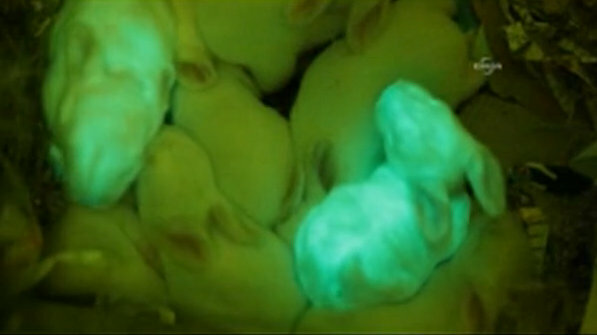 Bunnies that glow in the dark. Okay, maybe not in the dark, but under ultraviolet light. You're probably thinking, "That's nuts." And you wouldn't be wrong, but it's worse than that. I mean, didn't they ever see Night of the Lepus? Or heard about the Killer Rabbit of Caerbannog? Scientists are taking a risk there. The widdle bunnies were supposedly engineered in Turkey, a Muslim country. And using technology from Hawaii. What other Muslim-Hawaiian connection might there be? Can you say Obama? Is this part of some larger plan that Obama and the Moslems have hatched to destroy America? He's tried blowing up the economy for five years, and has done a marvelous job of bringing on financial collapse, but the U.S. just refused to fall. Perhaps the glowing Moslem killer bunny rabbits is the final piece of the plan. So, be ever vigilant. If you see any glowing giant killer bunny rabbits wearing suicide bomber vests saying "Eh... (chomp chomp chomp) Allahu Akbar, Doc" sound the alarm. I know this sounds like I'm suggesting that we profile glowing bunny rabbits. But better safe than sorry. Time for America to Fudd-up! It's a Muslim-Hawaiian pilot project. Next, they're going to try it on dogs. For when Muslim-Hawaiians want a midnight snack. Be vewy vewy quiet. I'm hunting muswems. They should be easy to shoot at night when they're foraging around for batteries. Hop and change from the Fertile Crescent. Are they sure that these widdle bunnies don't just fluoresce under a black light like a hotel bed does --- and for the same reason? Don't forget the Bloody Rabbit of the Plains! Never fear! We have the holy hand grenade Antioch! So, competition for the Energizer Bunny? But can they light-up AND bang the cymbals? But I thought that giant rabbits and awful Democrat presidents were natural enemies? Totally "BS" wording used. Instead of praising efforts of scientist writer is connecting it with terrorism. Writer must get some mental treatment. You criticize me now, but when the Giant Glowing Mutant Killer Moslem Rabbits come for you, you'll be singing a different tune. Gee, thanks Irfan. Without your mental acuity we would have thought that this post was some sort of parody or an example of sardonic wit. But now we know that it is the rambling of a deranged mind. Thank you. Thank. You. Hey Basil...could this be Limey 2.0? No, this one's still in Beta. Could this be a Muslim contribution to Science!? First it's rabbits, then it's LOOK SQUIRRELS! Basil, I was wondering if we could add "Teenage" and "Ninja" in there, somehow. Would "Giant Glowing Teenage Mutant Ninja Killer Moslem Rabbits" be okay? Also, Firefox doesn't recognize the spelling of "Moslem." It likes "Moose Lamb," however. I think that Dave Barry would agree that "Glowing Killer Muslim Bunny Rabbits" would be a good name for a rock band. Are we facing a Leporidae Jihadi problem? But we all know that Glowing Killer moosslime Bunny Rabbits are the rodents of peace. Glowing Killer moosslime Bunny Rabbits are no problem that cannot be solved with a dinosaur and a rocket launcher. Sounds like irfan should not have made that left at Albuquerque.